Egg whites tighten the pores and contain proteins that both repair skin and absorb excess oil, making them a powerful tool for dealing with acne. Separate the egg white from the yolk (save the yolk for cooking!). Whisk together the egg white with 1 teaspoon of lemon juice for one minute. The mixture will be messy, so apply it to your clean, dry face over a sink. Keep the mask on for 10 to 15 minutes — start whipping up your favorite dessert with that egg yolk while you wait! Once the mask starts cracking, wash away with warm water. If you’re not allergic to aspirin and you have oily or acne-prone skin, the salicylic acid in aspirin is a great acne-fighter. Crush four uncoated aspirin pills into a powder using the back of a spoon. Add water to create a paste. If you prefer a thicker mask, add a bit of honey. Stir the ingredients then apply the paste to your clean, dry face, making sure to avoid your eyes and your nostrils. Leave on for 10 minutes, then wash off and enjoy the clean feeling! The fatty oils in avocado are great for moisturizing dry skin. Mash up half an avocado until creamy. Add 1 tablespoon of honey, a cleaning agent, to the mix. If your skin is irritated, add a bit of plain yogurt for a soothing effect. If your skin is cryin’ for extra moisture, add 1/4 cup of pure virgin olive oil. Once all ingredients are well combined, apply the mixture onto your clean face and neck. Leave on for 15 to 20 minutes. For added relaxation, add a few drops of your favorite essential oil to the mixture before applying. Grab a banana for this moisturizing facial. Mash a peeled banana until it turns into a paste, then mix in 2 tablespoons of honey for an extra skin cleanser. If the mixture is too thick, add a bit of water. Apply the paste to clean and dry skin, letting it sit for 10 to 20 minutes, then wash the mask off with warm water. Your skin will feel soft and refreshed! The enzymes in papaya make it a natural exfoliant that fights free radicals, so say goodbye to dullness with this facial. Peel and remove the seeds of one papaya, then chop it into small pieces. Add 1/4 cup of honey for a natural cleanser. Using a blender or food processer, mix the ingredients until a paste is formed. Apply the paste to clean, dry skin, avoiding the eye area. Leave on for 10 to 15 minutes then splash off with warm water. Wash thoroughly, or the papaya juice could make your face look orange! A lemon juice and sea salt facial not only smells delicious, but it’s simple to make and great for rejuvenating skin! Combining 1/4 cup of sea salt with lemon juice is recommended. It’s up to you whether you want the mixture to be thick or runny, so add lemon juice accordingly. Apply the paste to your clean, dry face, avoiding sensitive areas. Close your eyes and relax for a few minutes while you let the lemon juice slough off dead skin cells, then wash with warm water. The uneven edges of oatmeal make it a gentle exfoliant, ideal for sloughing off dead cells to reveal the bright skin underneath. Combine 2 tablespoons of uncooked and unflavored oatmeal with 1 cup of whole milk in a small pot, heating them until a thick mixture forms. The lactic acid in milk will also remove dead skin cells. Remove from heat and add 2 tablespoons of olive oil for moisture. Wait until the mixture is warm but not hot then apply to your clean, dry face. Wash off the mask with warm water after 20 to 30 minutes. This facial is sure to soothe your irritated skin, and it’s so simple to make. Apply 1 cup of plain yogurt (make sure it’s not flavored — save that for the kids!) to clean, dry skin. Leave on for 15 to 20 minutes, and then wash away with warm water. The lactic acid found in yogurt will help soothe your skin, and the probiotics work to naturally heal skin irritation. If you’ve been out in the sun for too long, consider mixing 2 teaspoons of aloe into the yogurt for an extra cooling effect. Thinking about baking a pumpkin pie? 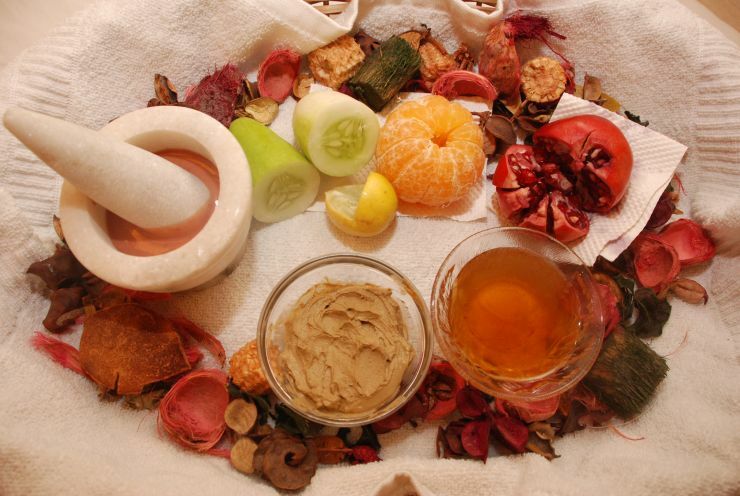 Save a bit of that pureed pumpkin to pamper yourself with a facial. Combine 2 teaspoons of pureed pumpkin with 1/2 teaspoon of honey and 1/4 teaspoon of heavy whipping cream. Mix all of the ingredients until they make a thick paste, then apply to clean, dry skin. Leave on 10 minutes before rinsing off with warm water. The vitamin A in the pumpkin has healing properties and promotes tissue repair, which irritated skin will love!